BICC cordially invites the interested public to a presentation followed by a discussion (in German) on “Ukraine conflict: Challenges for a new European neighbourhood policy” on Monday, 29 September 2014 with Dr Andreas Heinemann-Grüder, political scientist and co-author of the Friedensgutachten 2014 (Peace Report 2014). After a short introduction into this year’s Friedensgutachten of the five leading peace and conflict research institutes by co-editor Dr Marc von Boemcken, Andreas Heinemann-Grüder will introduce the following questions: What are the causes of the Ukraine conflict? What are the factors that determine Russian foreign and security policy? Is a new formation of blocks imminent? What can Germany and the EU contribute to solving the conflict? After the presentation, there will be time for discussion. 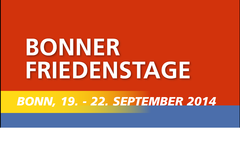 The event will take place in the framework of the ‘Bonn Peace Days’ (19 to 22 September 2014).